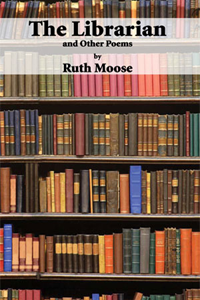 Ruth Moose’s The Librarian and Other Poems (Main Street Rag, 2009) is a quirky collection inspired, at least in part, by her nine years as a reference librarian. She wrote the “other poems” following the death of her husband, artist Talmadge Moose. At her home in Pittsboro, North Carolina, Ruth Moose has arranged her books in unconventional categories: Books by Friends, Books by People I Know, and My Favorite Books. In the little parlor next to her kitchen – where this interview was conducted – books of poetry fill the built-in shelves behind her. In fact, there are books of some kind or another – in stacks or on shelves – in practically every room of her house. Your husband. What kind of art did he do? He was a realist. He admired the work of Andrew Wyeth a lot, and Norman Rockwell. He loved to draw. And nothing bright will stay. It won’t go away. That old belief. Photos of the two of you replay. You weep and weep and cannot sleep. Dreams take you back, don’t let you stay. Photos of the two of you again, again replay. Those scenes in black and cold and gray. Images buried much too deep not to stay. The age-old law, that old belief won’t go away. Conversations replayed make you weep and weep. The script can’t change. It’s written in bas-relief. Those old beliefs steeped in grief move in to stay. Dreams take you back, memories play. Images, black and cold and gray, engrained too deep. How long after your husband died did you write that? I don’t know, because they were written at various times. While putting together a book you go back and pick up poems. My grandmother was a quilter. It’s sort of like being a quilter. In your mind you begin to see a pattern, and you sort of put in poems that fit. The librarian in the book has a cat, Percy. Is that really your cat? It’s based partly on a cat that lives with me. Or lets me live with him. His name is Patrick. Why did you change his name? Because you always change the names. [laughs] Even the cats. I think the cat would know. The librarian has a cat. Of course. What did you expect? Has the personality of a pit bull. And favorite chair, refuses to move. Little fire in her cozy little house? At the hell end of a hell day. So, who is the librarian? It’s not you as a young woman? No. A friend who lived next door to me for 12 years called me after she read the poems, and she said, “I thought I knew you. I don’t know this person.” What somebody told me – when this book was published – they said sometimes in trauma a persona comes to deal with it. A persona steps in to deal with the situation in sort of a healing way. And I didn’t know that. I just wrote. I made a list of the character traits that I see in the librarian. I’d be curious about your reaction: Lonely, Quirky, Fussy, Severe, Sensible, Practical. Oh. All that, and more. Well, I think she’s not the typical librarian. She’s not a stereotype. She sort of became her own person. Do you like the librarian? I do. I like her. She’s an interesting commentator on things, if that makes sense. Very observant in sort of this irreverent way. You would want to know her? Oh, yes. I would want to know her. [laughs] I kind of miss her. I wish she’d come back. It was like having somebody behind you that would make these funny comments and witty observations. And I enjoyed her. A dozen pillows, reads and underlines. Is a pen and ink person. Also scissors. Clips odd bits, to send to friends, family. It’s an old habit, long passed down. Over her shoulder? No matter. When were you a librarian? To a librarian, books are – in a certain sense – holy. Well, yes – I think so. But books have to be catalogued. They have to be organized. And I think I’ve always resisted that. I just don’t want to think of books as numbers. Librarians, in general, are unsung heroes. Next to junior high and high school teachers. To me they ought to wear crowns with jewels in them. [laughs] This is the last of the librarian poems. “I am alone in this big, wide world. When I read that poem at a public reading, a woman came up to me and said, “I’ve been at that traffic light.” And maybe that’s why you write poems – to say something that somebody else couldn’t say. Or didn’t say. But when I wrote that I knew it would be the last librarian poem. The Librarian and Other Poems (Main Street Rag, 2009) is by Ruth Moose. 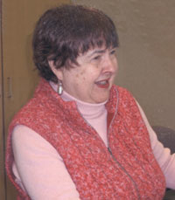 Her other books of poems are Making the Bed (Main Street Rag, 1995) and her newest volume, Tea and Other Assorted Poems (Main Street Rag, 2011). 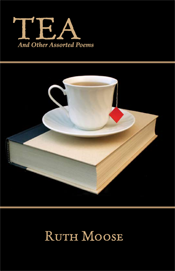 She has three collections of short stories: The Wreath Ribbon Quilt (St. Andrews Press), Dreaming in Color (August House), and Rules and Secrets (Pure Heart Press). Ruth Moose’s poems have appeared in The Atlantic Monthly, Redbook, Prairie Schooner, Yankee, The Nation, Christian Science Monitor, and other publications.